Think spring, plant now! If you are imagining your garden with a ribbon of tulips running throughout, your beds awash in yellow daffodils, or enjoying the first signs of spring with emergence of snowdrops, start digging. Fall is the time to plant your spring bulbs. 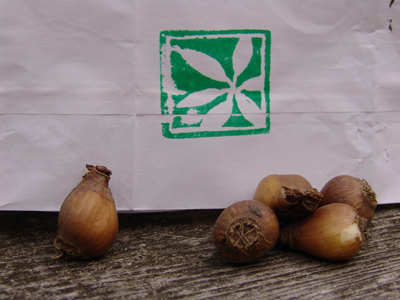 For this reason, Scott Arboretum’s members receive bulbs as their fall dividend. 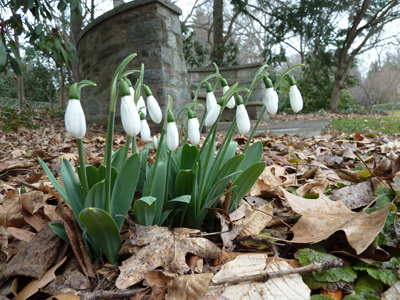 This year gardeners will be greeted by the fragrant white flowers of Galanthus woronwii. Differing from the common snowdrop (Galanthus nivalis) G. woronowii has interesting and wide, shiny green leaves. 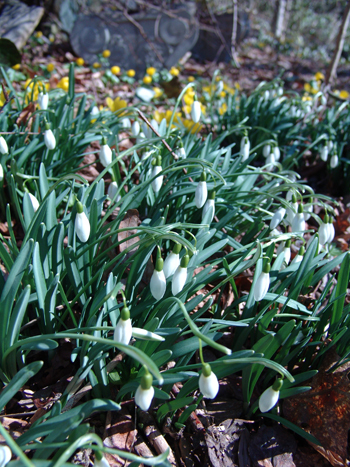 This species of snowdrop is native to Turkey, Russia, and The Republic of Georgia and named in honor of the Russian plant collector, Georg Woronow. Differing from the common snowdrop (Galanthus nivalis) G. woronowii has interesting and wide, shiny green leaves. The striking, nodding, fragrant white flowers reach 12 inches tall above the foliage. The flowers have three pendant white outer petals and the center inner floral segments are tipped in green. 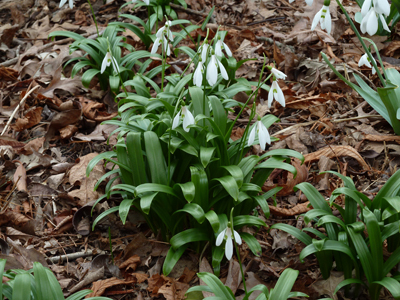 Snowdrops, like other members of Amaryllidacea, are resistant to browsing from rabbits, squirrels, and deer. This snowdrop will bloom in March. Small clumps make beautiful additions to an intimate courtyard or small garden. Larger masses can be used to create naturalized effects in the garden. These bulbs can be planted in the garden in late October. Plant them 3 to 4 inches deep and space them 3 to 4 inches apart. Snowdrops prefer well-drained soil and will flower best with ample amounts of sunlight; however, they can be planted in deciduous shade because they flower before the leaves emerge on the trees. I am a Swedish amateur in Galanthus love and care. My aunt hav got two varieties and on looks like this G woonowii. Do you by chance know where they originate from? Then we have G spicata and G nivalis. In Scotland for Galanthophilii I recommend the road between North Berwick and Dunbar in end january beginning of Ferbruary. I got off my bike and just staggered by the buty on both side of the small road when I came by bike one in 2011. Sorry, we have lost the records for the original source.